After Istanbul we travelled to Bogazkale and settled on the forecourt of the Hittite House Hotel (25TL per night, including electricity, shower and toilet in a tiny bathroom). From there we were able to cycle to the Hattusas Hittite settlement site (entry 5TL each - €2.50) and walked 5.3 miles (with lots of up) round the whole – huge – complex of walls, temples and houses which date back almost 4,000 years. 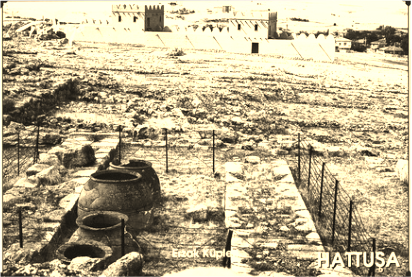 It was the capital of the Hattusa empire and mainly ruins now, but very impressive with some fine building technology, a big green stone which was a present from Ramases II of Egypt, a few hieroglyphs (most have been removed to museums) and lots of birds. We got there when the place opened at 8.30 and had the place to ourselves, by midmorning the tourist coaches arrived – and as we were to find during our stay in Turkey there are a lot of tourists and a lot of tourist coaches doing the “must see” sites at breakneck speed. It is possible to take your car (and even your motorhome) into the site and drive around on its excellent roads. As we left Bogazkale we stopped briefly at Yazilikaya just a few miles up the road to look at the rock carvings. These were big and very impressive, though oddly hidden away along narrow rock passageways. You can visit this place with your Hattusas ticket and will only keep you an hour at most.